Good Happenings at Grace Ridge: Accreditation, Inspiration and Awards - Grace Ridge Retirement Community - Morganton, N.C. When it comes to improving the quality of our services, programs and good moods way of life, we welcome the opportunity to open ourselves to outside scrutiny. Not only does this show we’re accountable to the community, but it also demonstrates our commitment to providing the best possible quality of life for our residents. As such, Grace Ridge was bustling with more activity than usual during the last week in April, when we invited a team of onsite surveyors to perform a rigorous peer review and evaluate our conformity and commitment to internationally recognized service standards and best practices. 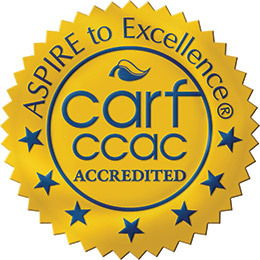 The result was being awarded our third consecutive five-year accreditation from the Commission on Accreditation of Rehabilitation Facilities/Continuing Care Accreditation Commission (CARF-CCAC). “We’re very proud of this accreditation because it demonstrates that we value the input of our residents and employees and are committed to putting the needs of our residents at the center of everything we do,” said Executive Director Brenda Yost, who noted Grace Ridge was also surveyed in 2006 and 2011. The visiting surveyors also highlighted the great partnership Grace Ridge has with Carolinas HealthCare System, the beautiful characteristics of our community’s building and grounds, our recent renovations, “stellar reputation” in the region and “excellent relationship” with the Morganton community. During the presentation, she discussed the importance of engaging residents and their families throughout the renovation process and the goal of creating a mountain lodge environment that was warm, inviting, reflected the Good Moods culture and felt like home. The highlight of the presentation, Yost said, was showing conference attendees the before-and-after photos of Grace Ridge’s exciting transformation that exemplifies its thriving, healthy and active lifestyle. Lastly, a feather was tucked in our good moods cap when Grace Ridge recently received both platinum and gold Generations Awards, an international competition for professionals who communicate to the 50+ population. Working in partnership with Walker Marketing, our Good Moods at Grace Ridge program and community brochure took platinum honors in the integrated marketing and publications categories, while our Creative Age Senior Art Exhibit and Good Thoughts blog took gold honors in the public relations and writing categories.